“GETT: The Trial of Viviane Amsalem” opens Friday at Sundance Cinemas. Not rated, 1:55, three and a half stars out of four. 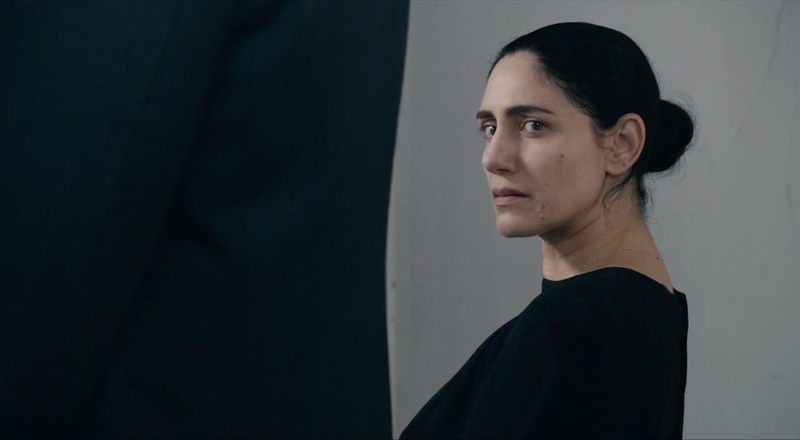 For the first five minutes of “GETT: The Trial of Viviane Amsalem,” we never see the woman who gives the movie her name. Instead, co-directors Shlomi and Ronit Elkabetz film from her point of view, so we see her view of her attorney (Menasheh Noy), her estranged husband (Simon Abkarian) and the three-member religious court of rabbis that will decide her fate. But never her. For the next five minutes we see Amsalem (played by Ronit Elkabetz), but we don’t hear from her as she sits silently, listening as the men around her argue. The technique is effective at putting us in her place, and showing us just how voiceless she is. In Israel, such a religious court has to approve a divorce, and even more significantly, the husband has to grant his wife a divorce. After 30 years of marriage, Viviane is long past ready for her freedom from Elisha, who hides his cruel and manipulative nature under his piety. But Elisha refuses to grant it. What results is two hours of riveting courtroom drama, as Viviane and her attorney fight for her emancipation in a roomful of men who don’t believe God wants her to have it. Elisha seems determined to run out the clock on his marriage, delaying hearing after hearing as the trial goes months and months, then years and years. A parade of character witnesses come forth; his brother says they should reconcile because Elisha is a good provider who isn’t openly abusive. Then her brother comes forward, and says the same thing. At times, the court’s tortured attempts to keep the couple together border on the comical. Elisha begins skipping hearings, but the court refuses to find him in contempt and force him to appear. He tells Viviane that if she moves back home for three months, and Elisha doesn’t show up at the next hearing, he’ll put him in jail. Viviane lives up to her end of the bargain, but when Elisha doesn’t appear, the rabbi refuses to do anything. She’s moved back home! The couple is reconciled! It’s like a bad joke. The Elkabetzes keep the action entirely in that claustrophobic courtroom (aside from a few moments in the waiting room outside), so all we know of the marriage is what we see there. Elisha is a master manipulator who knows that the law gives him the upper hand, cruelly feinting that he’ll accede to Viviane’s wishes now and then before changing his mind at the last minute. Viviane is on a slow burn, but the constant injustice she feels in the courtroom eats away at her. After scene after scene of arguments and counterarguments, “GETT” suddenly focuses on Viviane’s face for a couple of minutes, as the music swells and we gaze deep at the changing expressions playing on her face. Finally, we see her. It’s an interesting coincidence that “GETT” is opening at Sundance Cinemas on Friday the same day as “She’s Beautiful When She’s Angry,” a documentary about the feminist movement of the 1960s. “GETT” shows that sexism is not an aberration, but baked in by design into some of our deepest institutions, and fighting it is a long journey down a hard road.